My client asked me to recreate a piece that caught her eye in my portfolio. You can see that metallic dresser below and in my gallery here. The original dresser was made for a client in Staten Island, NY and was done several years ago when browns and golds were the IN THING (still are in my house….shhhhh!). She wanted me to recreate this piece in a cool tones that have now become the IN THING….greys and silvers. So I did just that with a silver dresser! 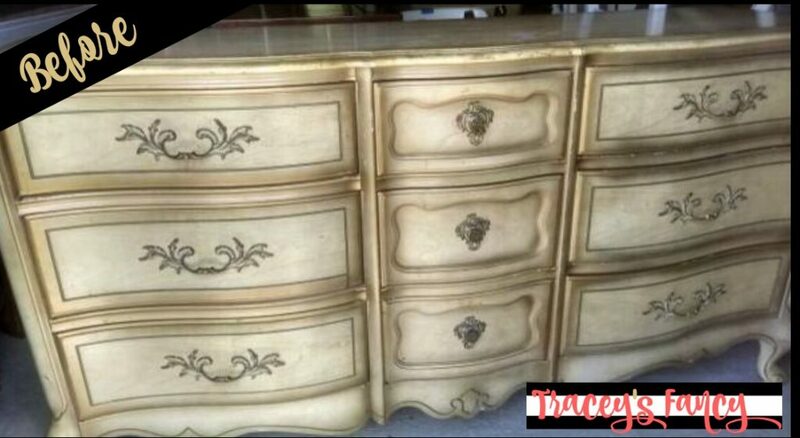 The french provincial style dressers have become nearly EXTINCT here in south Texas with the DIY wave and everyone in the world deciding they want to be a furniture painter and leaving me with absolutely nothing to source from and have to fight like a dog to get my hands on!!!! BUT I FOUND ONE! I may have had to drive 3 hours round trip to get it…..but SCORE! For the body of this piece I chose Yankee Blue, which is a nice blue/gray color for the undercoat and topped this with a creamy ivory called Fluff. I then used silver leafing for the drawer fronts. This technique is so easy and makes such a huge impact! The metallic silver dresser is stunning! I did a short “how to” video of the silver leafing process for you here. For all the products I used for silver leaf, look at the SHOP section below! I finished off the hardware and nail heads with my favorite silver metallic spray paint before putting them in place. 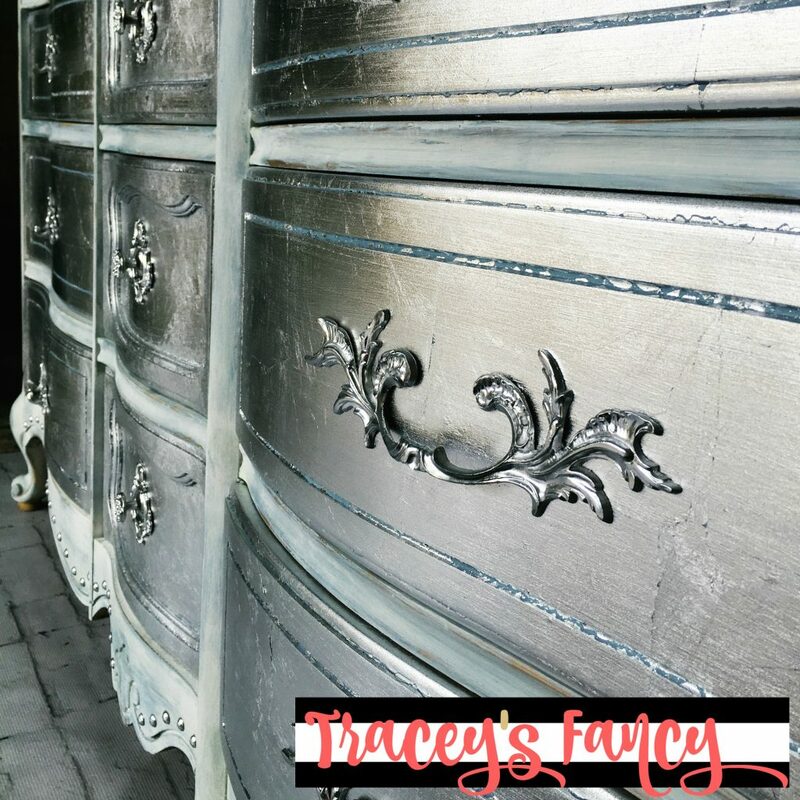 This gorgeous silver dresser with its multi-tonal softly distressed shimmering front finish is now on its way to sunny Florida…..where it will add a little GLAM to the life of a busy girl! 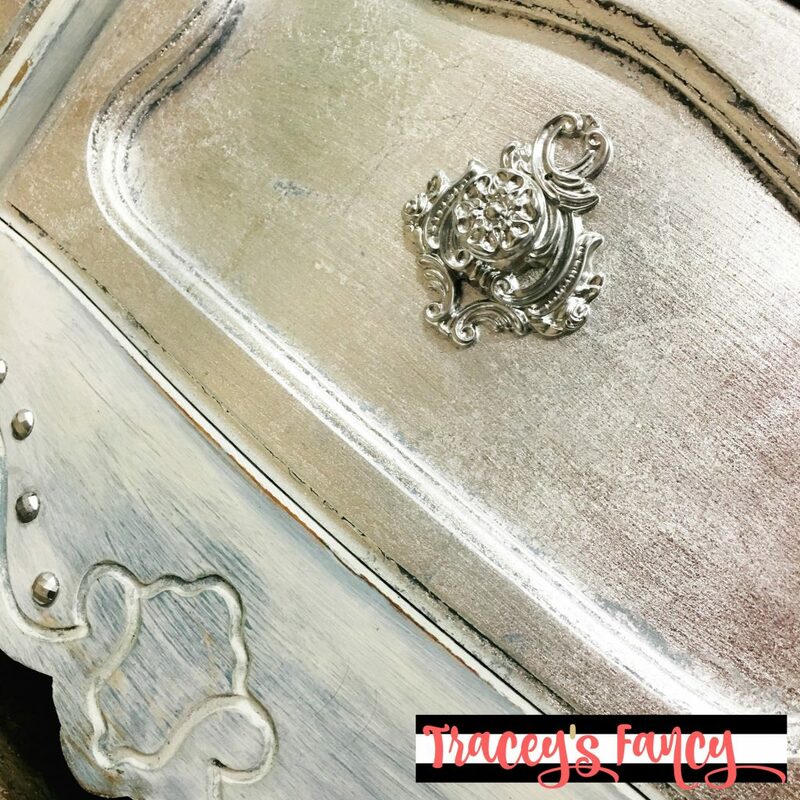 For your shopping convenience, here are the products I used in this silver metallic finish. You can get this same look using these Dixie Belle Paint products. You can also find my favorite products and tools in my Amazon influencer list here. If you’re ready to create a metallic leafing finish yourself… I’m the girl to help you! This Rose Gold tutorial is the same process… I’ll take you through it step by step. If you would like to paint your own furniture ….but lack confidence with where to start….try my introductory furniture basics course! I LOVE IT!!! I can’t WAIT to do this on my daughters furniture!!! Right now it’s ugly stain….that orangey look…..and I’m ready to change it. It’ll probably be white and gold. Thank you Angela!!! White and gold will be gorgeous!!!! Let me know if you need have any quesitons before you get started! And send pics please when you are done! I’d love to see the end result!!! I’ve been itching to try mercury glass spray paint on something. Do you think subbing it for the silver leaf would result in a nice finish? Thank you Demetra! To be honest I have never tried Mercury Glass spray paint. I’ve never even heard of it! But I love mercury glass and would love to see your results if you choose to go that direction! So far….I’ve not found another product that offers the same brillaince as actual silver or gold leafing! Gorgeous!! What stain did you use over the silver leaf? Did you do any distressing to it? Thank you very much Lyn! Love this look. I’ve never seen anyone do this before. I’m looking to redo a french provincial dresser I picked up at a flea market last week, and I want to do this. I’m looking on amazon at silver leaf sheets. Do you recommend a brand? What are your thoughts on the aluminum? You will need the adhesive and sealer also….I use the same brand as the leafing. If you have never used silver leaf….you will love it! It can be addicting! Have fun and let me know if you have any more questions! Also, how durable is the finish? The finish is surprisingly durable!!! Is the finished product all silver? One looked all silver and the other looked blueish gray in places with blue in the cracks and silver other places. I liked the blueish gray with silver one. How do you get the blueish gray effect? What paints and when do you apply? Also how do you distress without ruining the metallic silver applied? There are two dressers photographed with silver leaf on the drawer fronts. One dresser has the blue-ish gray tones under the ivory and also under the silver leafing. I used Heirloom Traditions Paint. 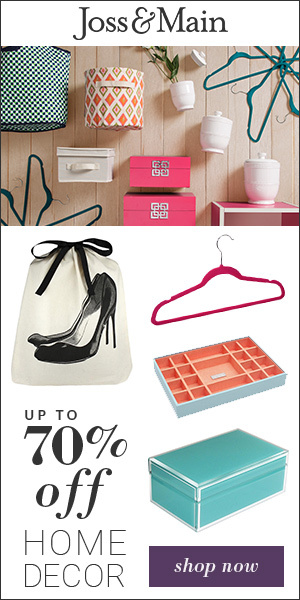 You can order directily from there website…and be sure to use my coupon code FANCY for a discount. I believe I listed the paints in the “shop now” section at the end of the blog. You can actually just click on the pictures of the product and it will take you directly to their site. I painted the drawers in the Moody Blue before I applied the silver leaf…so when the leaf cracked you would see the blue underneath. I did not distress the silver leaf and really don’t ever. I did paint the moody blue under the Irish Cream White also…so when I distressed the white…the blue would peak through. I hope this helps! 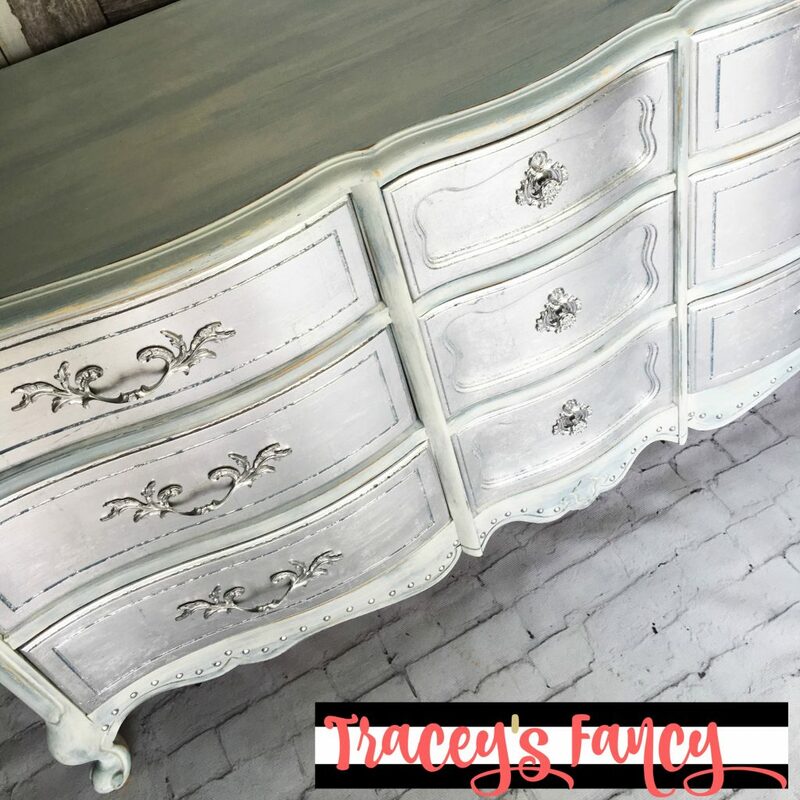 Tracey, I did the Silver Leaf on a dresser and once completed I sprayed the Sealer on! Now it has a tacky feel to it! How can I get the sticky feel gone? Hi Shelley! I’ve never had the silver leaf be tack AFTER I applied the sealer. I know this sounds crazy….but is there any chance you accidentally sprayed the adhesive as the sealer instead? I only ask…becuause I have done this very thing! They make the cans identical…and I have mixed them up. I had to lay down more silver leaf….and then re-seal. The sealer should dry within an hour at most…and not be tacky at all. I hope this helps! I do not prime before leafing….the leaf adhesive is like cement! My backdrops were ordered from a company on Etsy….and I swear the name has just left my brain. I will see if there is a label on the container that I store it in and send that to you! THanks so much for your comments…and for being here! Thank you Diane! Enjoy the process!!!! It is addicting! Hey Tracey, loved watching your video, you’re too funny .) Painting with a glass of Merlot in the other hand is the best thing !! Love, love, love this dresser ! Reminds me of old Hollywood and those beautiful actresses of the 20’s. I am so glad you did a tutorial on silver leafing, i have been so intimidated by it. Don’t know why, i do just about everything else as far as painting and lots of crafts and building some things ( might not be perfsct ) but i did it ! Anyway, i now think i can handle the silver leafing, it’s so pretty that i just have to try it. I mean how bad could it turn out….right ? I Pinned and subscribed so can’t wait to see hat other things you have done .) Have wonderful week ! This is such a beautiful piece. How much of the moody paint did you use? Hi, silly question, but what do I do if I don’t like it? Is easy to remove or pretty permanent? I am going to recreate the look on 2 end tables and a coffee table. Hi, Tracey! Love, love, love this, and can’t wait to try it!!! Thank you SO much for sharing your technique and info with us! You’re a doll! Tracey!! I have found my people!!! Yay!! I am going to redo my Gramdma’s ancient maple bedroom set. I dislike dark wood sooo much! I’m beachy – and now impractical and glam n glittery!! I’ll take pics before and after. During if I have a question, but the artsy me will just go with it..
Tracey, I saw this in June and bought the paints and silverleaf. I just did the silverleaf on and end table. On dealing it right now, then going to do the top with the white. I want to seal the table top with a gloddt finish. Do have one you recommend? Did you sand the dresser down first? Or just paint over it? I think you did an amazing job!! Love the finished look! I just found and signup on your site. I would have never thought in a million years to paint this gorgeous piece of furniture metallic, but after seeing yours, wow, how fabulous. Thank you for helping me to go outside my box. I am loving your designs. Thanks for sharing. Hi Tracey, u r so sweet, thank u for sharing. One question. I probably already know the answer but I’m hoping you have a different answer, did you prime or sand the piece before you applied the first layer of paint? Thank you. This transformation is truly incredible. Thank you for sharing. I’m looking to redo a wardrobe, and I’m trying to decide which method to use. The wardrobe currently has a layer of paint on it, and I have never used chalk paint before. Does it really work without stripping the original piece? Also, I understand how you did the leafing, but how did you achieve the layered look between the blue and the white colors? Did you cover all in blue, wait for it to totally dry and then dry brush the white on, or did you dilute the white? Not only have I never worked with chalk paint, but I’ve also never layered paint before, so I would be very interested to hear more about the process. Thank you so much again. But honestly….the rose gold tutorial is by far the better lesson….it is all encompassing and full of great info! Feel free to check out my online painting courses too! We will be learning color blending in July…and metal leafing in August! I am new to blogging and one of your new fan as well. 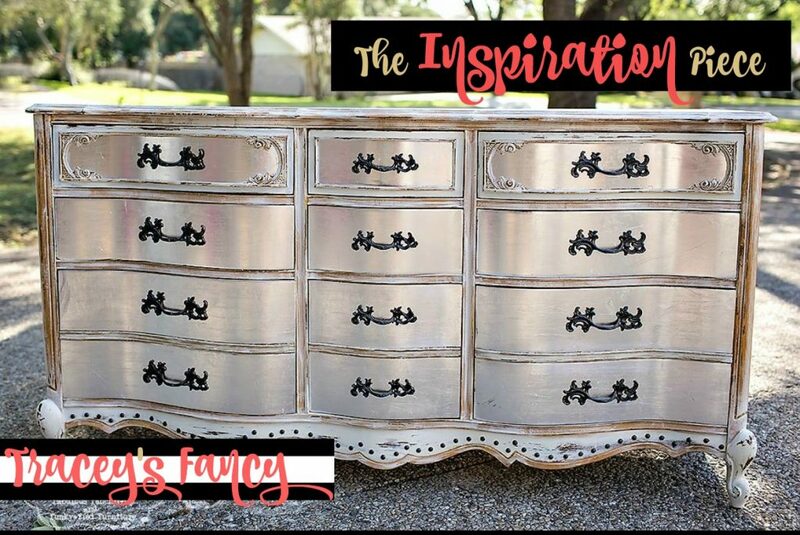 Wow, how amazingly you have transformed those dressers. Thank you so much for sharing with us. I would love to have you on my site and would appreciate if any advice you have for a new blogger like myself. Tomorrow would be a month of blogging for me! Hi Denise!!! Thanks so much for your heartfelt message!!! I appreciate you taking the time to enjoy my work and to comment as well! Absolutely you can use a pale green with the silver! Dixie Belle has a light green called Farmhouse Green that I just love!! You can order your Dixie Belle Paint from my main page…just click the link and choose your colors! You show your husband who the decorating boss is! LOL! This is to die for! I am definitely going to try this. Never leafed furniture but I am so excited to try, your video was very easy to follow. What do you suggest color wise to replace fluff? Oh I’m so glad you are inspired to try something new! !